When driving through the waving grasses on the Highveld, the beautiful bulbs that grow amongst them often go unnoticed since the grasses dwarf them. But with a bit of practice, you will at least spot some of them. The best way, of course, is to take a walk…. 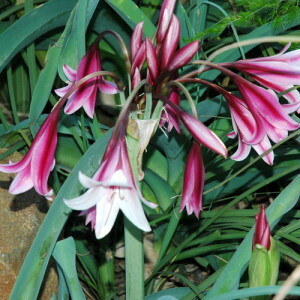 Crinum bulbispernum (Vaal or Orange river lily) may be one of the easier ones to spot. It prefers a damp spot and can quite often be seen growing in vleis along the major routes. Very distinctive is the bluish, undulating leaves and white or pink flowers borne in profusion early in the season. It is well adapted to garden conditions provided it is planted in a sunny spot and receives enough water in the growing season. Crinum graminicola, the grass lily. A more difficult one to spot is Crinum graminicola. It is hidden amongst the grasses but once seen will not be easily forgotten. The green, broad, wavy leaves almost have a leathery feel. Flowering time in early summer is relatively short but spectacular. Plant it in a sunny spot in a sandy mix in the garden. Do not overwater. A much more dainty plant that is found on the Highveld is Dierama mossii (Hairbells). Most dieramas are associated with cool high altitude habitats but this one occurs from the Magaliesberg to Dullstroom. Give it a sunny position and water well in the growing season. It blends very well with grasses such as Melinus nerviglumis. Eucomis autumnalis, the pineapple lily. 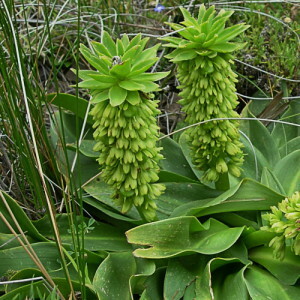 It is quite common in the grasslands.Eucomis autumnalis (pineapple flower) normally occurs singly. The light green leaves are very attractive and the white & green flowers are very unusual. It has a very long flowering season and makes an excellent cut flower. If space allows, try Eucomis pallidiflora. The inflorescence can easily be 1m tall and is very conspicuous amongst grasses. It does best in a damp spot in full sun. 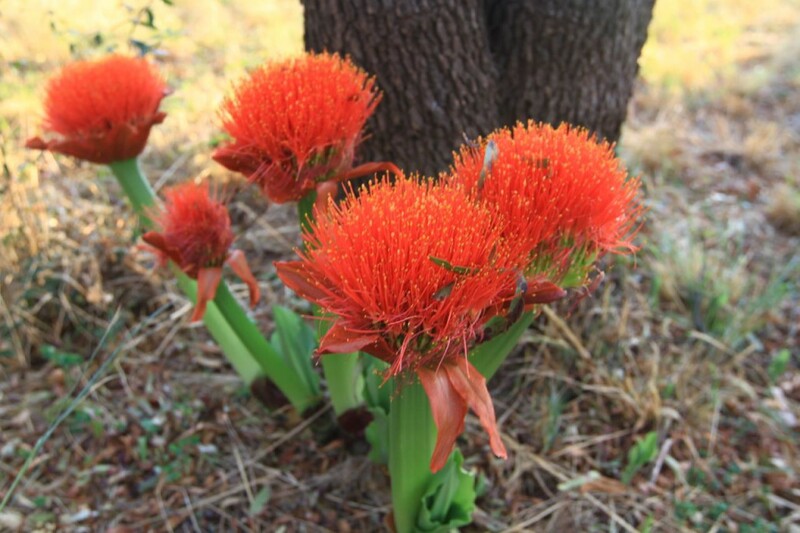 If you have a filtered shade area in you garden, consider Scadoxus puniceus (blood lily) They are more associated with a savannah veld type but are very well adapted to garden conditions. 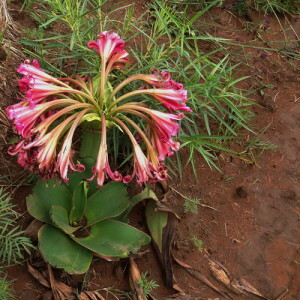 The blood lily flowers very early in spring and the red flowers can be spotted from afar. Another shade loving bulb that occurs in the grasslands, is Freesia grandiflora. 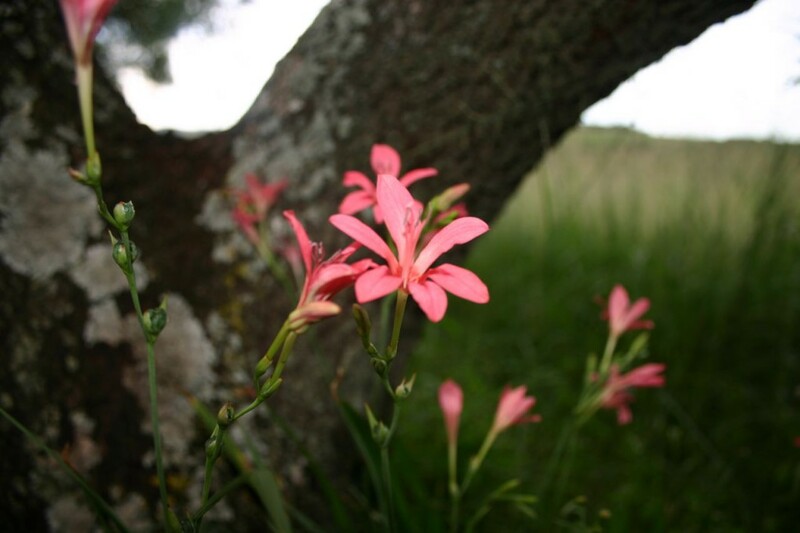 Only two freesias occur on the Highveld and is predominantly a winter rainfall species. The Freesia behaves as if it is still part of the Cape Floral Kingdom and flowers in mid-winter when little else is in flower. 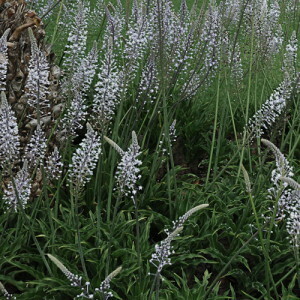 Schizocarpus nervosus, the white squill. 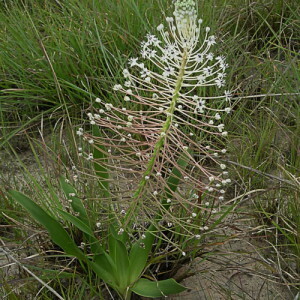 The leaves of the Schizocarpus nervosus, the white squill, are almost leathery to the touch; the inflorescence is quite huge although the individual flowers may be small. It works best if interplanted with small grasses such as Eragrostis racemosa or Sporobolus stapfianus. Merwilla plumbea, the blue squill. A plant that is very similar is the blue squill, Merwilla plumbea. It prefers to nest amongst rocks or rocky slopes where seepage occurs seasonally. However, it is an easy garden plant. Plant them in a group for the best effect. Even without leaves, the scaly bulbs that are above ground, are a nice feature. Watsonia pulchra. Picture taken near Dullstroom in Mpumalanga. 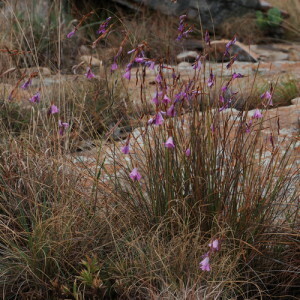 Watsonias only occur on the high-lying Grasslands and not really in Gauteng, but many of them are well adapted to the Gauteng climate. 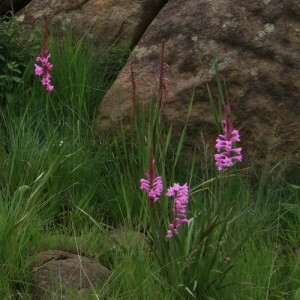 Watsonia pulchra occurs in the Belfast area and further east is Watsonia transvaalensis that prefers a damp spot; some Watsonias from the eastern Cape such as Watsonia pillansii and W angusta do very well on the Highveld. Most of them are evergreen. They all prefer a sunny spot.